Epic Arts believes in a world where every person counts and where people with disabilities are valued, accepted and respected. We promote the inclusion of people of all abilities and disabilities through the arts. We use the arts as a form of expression and empowerment to bring people with and without disabilities together. We begin delivering inclusive arts projects in schools, hospitals and communities in the UK. We travelled to Cambodia and saw a need for the arts in Kampot. Through our supporter’s donations, we built a fully accessible Arts Centre – the first of its kind in South East Asia. Our Special Education Project was born after we discovered there was nothing to support children with learning disabilities in & around Kampot Town. We started Epic Encounters, a group of talented dance and theatre performers from Cambodia some of whom happen to have disabilities. The Inclusive Arts Course (IAC) started in March 2013. New students began working together on a two-year Arts-focused course. Epic Encounters receive funding for their first tour of the UK. 9 students graduate from the first class of our Inclusive Arts Course. 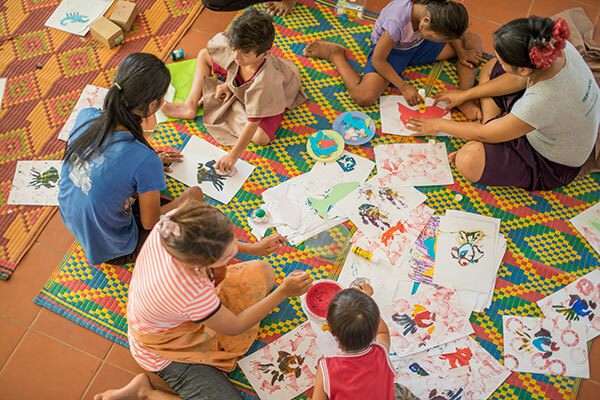 a new community outreach team, ‘Arts Team’ was formed and began to deliver art lessons in local Kampot schools. 14 new students began on IAC.